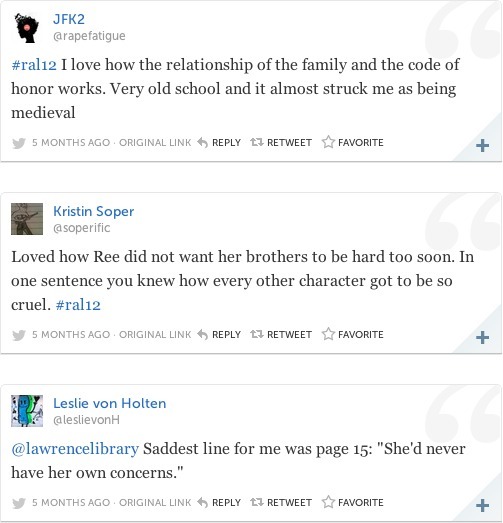 But I think my very favorite is from this fall, when I had the opportunity to moderate a Twitter book chat for my library’s Read Across Lawrence pick, Winter’s Bone. Was it chaotic? Yes. Did I know what I was doing? No. Was I freaking out the entire time it was happening? Yes! But when I sifted through the results on Storify afterward, I was amazed at the breadth of the discussion and connection we had achieved. And if I can do it, anyone can do it. You heard me — you can do a Twitter book chat for your library. Yes, really. You.